I haven’t had time for any real writeups, but in the past couple of months I’ve had a Taco Bell taco with bacon on it(gross), ribs(not great, but edible) and “breakfast shots”(ok except for the cheese sauce. excellent packaging) at Burger King and other fast food disasters, but at the moment, I would like to mention a couple of local-to-Lafayette eateries. First and foremost, I’d like to publicly state how much of a ripoff the Great Wall Chinese buffet near SR52 and Union is. I’ve only eaten there 2 times. The first was pretty good, and it was a little expensive, but within the realm of reality – around 8 bucks. I went last night, and had some decent, but standard chinese buffet food, but got a bill for $19 something. When I asked, I was informed that the buffet was $18 and the rest was the cost of a drink. I don’t know how exactly this happened, but I can’t imagine they would be as busy as they were if it was 18 bucks for a buffet. especially when En Lai has a better one and it’s only $5. Either way, never going back there again. Second, I’ve had some good sushi experiences lately. Unfortunately, the Bluefin Grill ended their all you can eat lunch sushi deal, but as a result, I found myself going to Ah-Z at Chauncey hill a lot. Ah-Z totally sucked the first time I ate there, but has improved vastly. The rolls are big, the rice is not to dry and the price is reasonable. They’ve also got a pretty good chicken katsu bento that comes with a salad, soup, and a couple pieces of tempura. I also finally had a chance to stop in Maru sushi recently. It wasn’t super upscale, but it’s a nice place. I had an avocado and cucumber roll and a couple pieces of maguro. It was very fresh, and I got some soup and a couple of sides with it. The staff were super nice and the sushi menu was one of the larger ones I’ve seen. Definitely headed back there soon. Lastly, I wanted to mention the Green Sprout. It’s a cool little pan-asian bakery / eatery right across the street from Maru. I’ve been there several times and really like it. 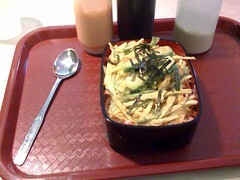 Of primary interest is their Baru sushi, which is kind of like a sushi salad served in a bowl. It’s got rice at the bottom with sushi components like cucumber, imitation crab, fried egg, nori, etc piled up on top of it. It also comes with optional spicy mayo, wasabi sauce and a sweet soy sauce. It was altogether pretty awesome, and much to my pleasure they also have kimchi! They have a lot of other dishes I’m anxious to try. The time has come around again for me to think about a new stereo for my truck. My current head unit, a Kenwood mp2032, is still working fine, so I kind of hate to get rid of it.. The reason I’m entertaining the idea is because the drive on my phatnoise phatbox mp3 player finally died. For those unfamiliar, the phatbox is the OEM version of the Kenwood music keg a hard drive based mp3 storage solution from the late 90’s. It was a nice system for it’s time and integrated with Kenwood head units well. It’s inherent shortcoming was the use of mechanical hard drives as well as a proprietary file system that would only allow drives sold by phatnoise to work. Now that my drive has died, I’m stuck listening to the radio and CDs. The MP2032 can play mp3 CDs, but I find the 10 or so album capacity of a CD really isn’t enough variety and I don’t like toting around and constantly switching a pile of CDs. After browsing Crutchfield for a while, I’m thinking there are two likely candidates for mass media storage – a head unit with either a usb port or iPod controls. I think the usb option is more my speed.. My iPhone doesn’t hold much music so I’d have to get a new pod if i went that route. A 32G flash drive costs about $50 at the moment and should hold most of my music collection. Still not sure if I’d want the usb port on the back or front of the receiver though. There are pluses and minuses to both. I think I’m going to stick with Kenwood. I’ve been using their stuff since Pioneer quit adding features to their 1.5 DIN GM fit head units. The KDC-X693 and KDC-MP438U are the two main units I’m considering at this point, although I’m still debating getting a similar unit with the bluetooth hands free calling system built in.